Where Are You Birding This First Weekend of August 2010? August is here, which means that all too soon your local migratory birds will be gone. So will our long, lazy days of summer. Enjoy them — the birds and the days — while they last! What will you be doing this weekend and will you be birding? Share your plans in the comments below. I’ll be relaxing Rochester-style, which may not entail observing any birds at all. Come to think of it, I’m not sure what relaxing Rochester-style entails. Charlie doesn’t know exactly what he’ll be doing either, but his plans no doubt include relaxing English manor-style, a tradition that may be familiar to those of you who watch public television. Corey doesn’t know how to relax, so look out for him anywhere in the Tri-state Area, particularly on Friday when he’ll be escorting Will from the The Nightjar and his wife, Danika, around Jamaica Bay, hoping to get the two of them life birds. I don’t know what I did with my birding guides. I had 2 or 3 when I lived in New Orleans. More on that at: http://dianneglave.wordpress.com/2010/03/08/black-and-birdwatching/. I used to see snowy egrets there. I’m going to be watchful in August for more birds . . .
Hopefully also at Jamaica Bay. I’m flying in on Friday at 5:30 to JFK, but I can’t seem to figure out a way to go birding with my luggage, so I plan on putting myself on the subway at 4am Saturday to get to the bay around dawn. Get in an hour to two of shorebirding before making the trek back to Manhattan. Niiice & spooky! Cool blog, too! 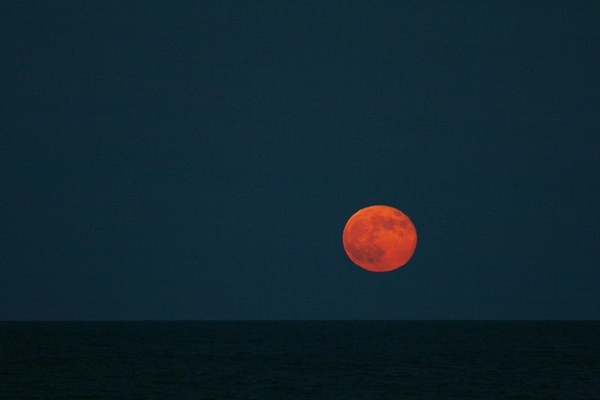 I for one love your Moon Shot over the Atlantic. I have always found Moon Shots fascinating. When I first saw it I thought it was a sunset. Oh my this is the kind of moon that I like to take a picture. It’s beautiful!! Now I have a question do I have to set aside my hummingbird feeder now? I am in Michigan and I guess we are close to have a cold weather again. Thanks and happy Friday! That’s a beauty of a shot! Glorious shot!! I love the colours. Superb capture of the moon!! Nicely done!! I agree, a moon like that could never get enough love. It’s gorgeous! Have fun relaxing BBC-style and drink a Pimm’s for me. On second thought, don’t. Pimm’s is one of those nasty things only the English understand! Your moon shot is absolutely gorgeous! I love the colours. It’s all filled up with magic. I like to take a shot every now and then of the moon also, it’s not easy. Where Are You Birding This First Weekend of March 2017? A Striated Heron comes into our garden!